Our skip bins come cheap and easy to meet your everyday and one-off waste disposal requirements. Whether you're renovating or simply have household rubbish to be removed, we can come over to install a suitable skip bin on your premises and cart away the rubble or rubbish at regular intervals. 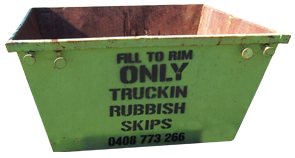 At Truckin Rubbish, we pride ourselves on providing the cheapest skip bin in Brisbane region. With a wide coverage across Brisbane, Logan and Ipswich area and highly affordable and punctual services, we aim to leave behind clean premises and happy customers. We are a locally owned and operated business, which means we are always one phone call away from handling your waste removal requirements. Say no to hassles and mess around your premises! The fact that we are locally owned and operated gives our customers fast access to our services. We can even fulfill same-day rubbish bins request in Brisbane, Logan, Ipswich and the surrounding suburbs. Convenient, affordable and environmentally friendly, our skip bin hire service offers a great way to remove rubbish from your premises and makes sure all your rubbish meets sustainable treatment before ending up in landfills. As a certified company, we have necessary approvals from the local council to run waste disposal errands, so you don't have to worry about anything at all. Whenever you need affordable skip bin hire in Brisbane, know that we are here to assist you. If you are remotely located in any of the suburbs of Brisbane, Logan and Ipswich and don't know where to find a skip bin hire service that provides doorstep assistance, you can simply lay your trust in Truckin Rubbish for that matter. We cater for customers across the Brisbane city and surrounding suburbs as well, which means skip bins in Brisbane Southside are readily available, and that too for an affordable price. Why You Should Prefer Truck in Rubbish to Hire a Skip? The fact that we offer the cheapest Brisbane skip bins is one good reason to prefer our services, but there's a whole lot of other features that make Truckin Rubbish the first choice of customers throughout Brisbane, Logan and Ipswich. Our Logan skip bins service is as fast and convenient as in any other area. We can provide the suitable-sized skip bin and offer flexible rubbish removal assistance at a highly competitive price. No matter the number of skip bins you need – big or small – we can deliver. How to Hire Mini Skips & Rubbish Bins in Brisbane? Hiring a skip bin in Logan, Ipswich or anywhere in Brisbane is quick and simple with Truckin Rubbish. Just let us know the type and size of skip bin you need, and our online booking system will make sure that you have it at your doorstep whenever you want. 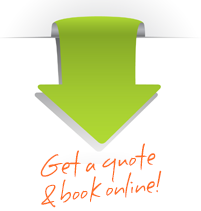 Want an instant price quote for your requirements? Simply fill out our online form to get a tentative quote. If you have any query, you may leave us a message or speak to our experts over phone. At Truckin Rubbish, we'd be more than happy to address your queries.